Healthy eating can be difficult when you’re not organized. It can also be difficult if you don’t eat healthy snacks. Keeping your stomach fueled with clean, nutrient-rich foods will not only help keep you on track with a healthy eating plan, it will also keep you in a good mood and provide the energy you need to get through the day. I have to admit, I have been indulging in too many sweets lately… saying yes to everything (chocolate, desserts, white bread, baked goods, etc). My body has had enough and is literally screaming to get back into a healthy food plan! So, the best way for me to do this is to commit to eating well. How do I commit to eating healthy? For me, it’s all about planning. Shopping smart and making sure I have the right foods prepped and ready to go in the fridge. 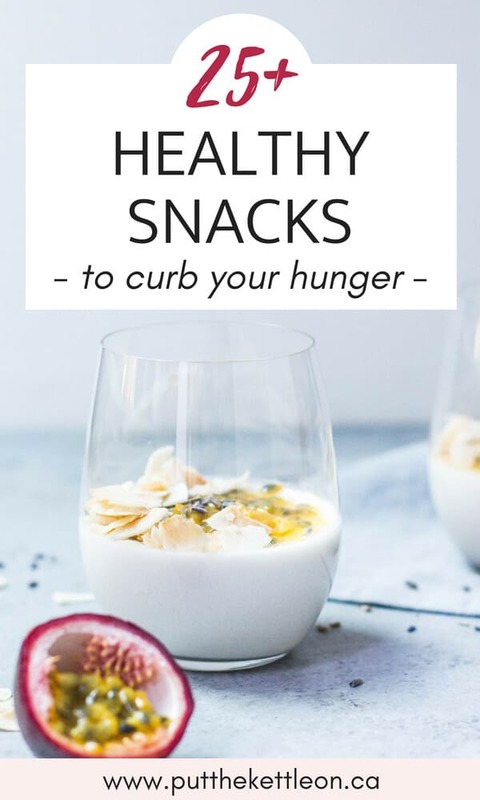 I personally need to eat little and often, so having the right snack options is extremely important to be successful in my healthy eating plan. *Note! If you are starting a healthy eating plan after overindulging in too much sugar for a while, expect the first few days and up to a week to be a little bit more challenging while your body gets rid of the sugar. 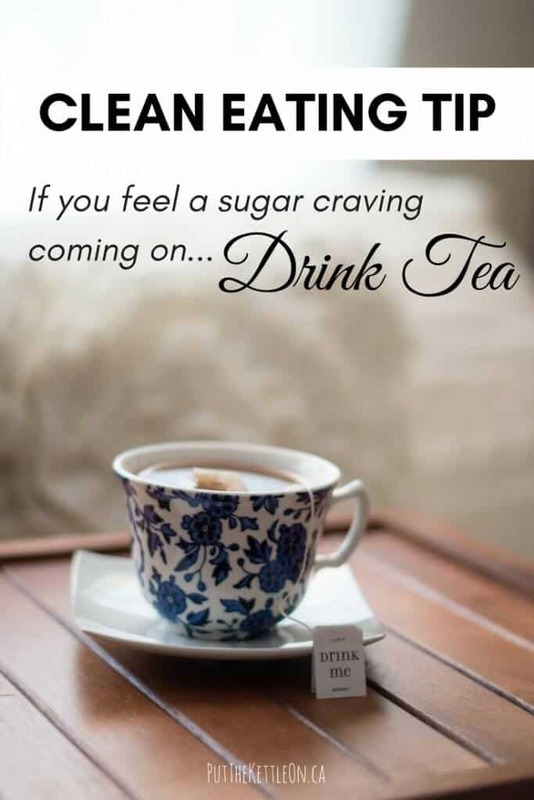 TIP: If I feel a sugar craving coming on I opt-in for a tea instead (no sugar of course). 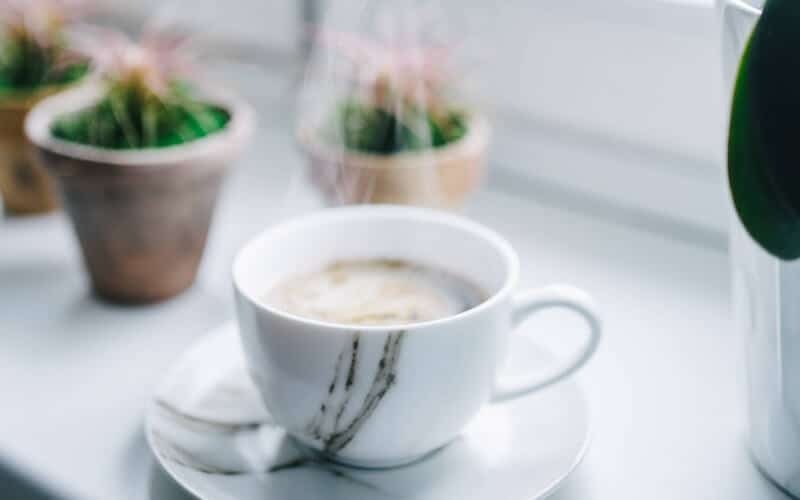 If I’m just starting my healthy eating plan I tend to drink a little more black tea in the beginning (as a crutch, since I love it so much), but once I am on track I swap the black tea out with strongly flavoured herbal teas or green tea. Figure out what your healthy alternative ‘crutch’ is. 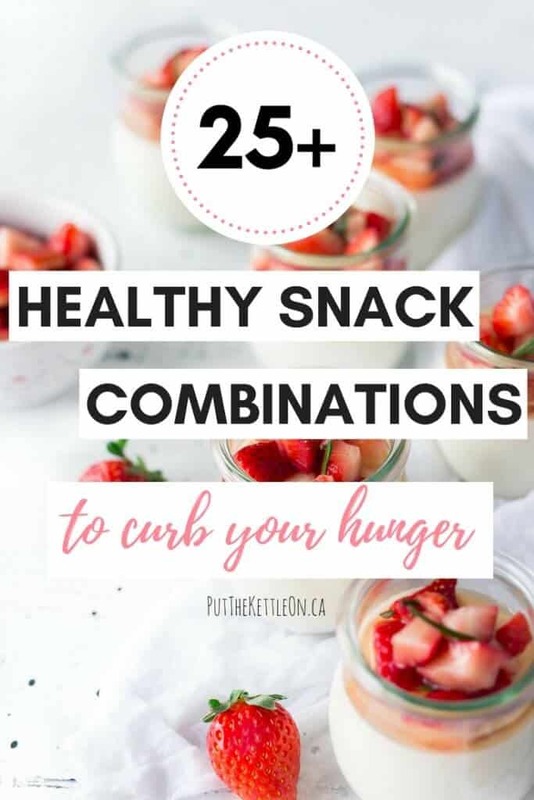 Here are my go-to healthy snack combinations that help curb hunger, to get you to your next meal… (without thinking about chocolate)! Sliced apple with 1 tbsp almond butter on the side. Sprinkle cinnamon on apple for a kick! Bean salad – make ahead and keep in the fridge in small containers so they are easy to grab and go. Edamame with a little sea salt. Go with organic if you can as regular soybeans are GMO. Whole wheat rice cakes (or Wasa Fibre crisps) spread with hummus + add cucumber and black pepper on top. Chopped cucumber, red pepper and feta cheese – drizzle olive oil, balsamic and crack black pepper on top. Whole grain toast with sliced avocados & tomatoes + salt and pepper. Can of tuna with black pepper and sea salt + chopped cucumber. Drizzle lemon juice and olive oil. Tell me… What would you add to this list? What healthy snacks do you enjoy? Mmmm, I could totally go for some dill pickles with cheese right now! And fruit and veggies smoothies are something I don’t make often enough! THANK YOU for this list!! I am always looking for healthier ways to snack!! Thanks for the ideas! I think I need to do better at mixing a couple things for a snack. I tend to just pick one thing and it’s not enough to keep me full. I appreciate all the combo ideas. OMG! thanks for all these little ideas! I’m such a snack person, it’s perfect for me who is doing the Whole30 this month and needed some ideas to cut the sugar off but not that much haha! Oh yeah! I love laughing cow cheese! That’s one of my favorite combos. Have you tried the crispy dried okra? I discovered it at Kroger yesterday and am hooked. It’s perfect for when I want something salty and crispy. I’m going to print out your list! Thanks for these wonderful ideas and combos! Thank you for all of the healthy snack ideas and for the healthy muffin recipes! These are great! I just started prepping for my wedding and I totally need these snacks! This is so so helpful, I especially love the tea tip as I’m not eating refined sugar right now. I think I’m going to put this list on my fridge!! Oh these are perfect for my diet. I can’t wait to eat these. Love the yogurt/applesauce/cinnamon/almonds combo – sounds like it would satisfy my stomach AND my sweet tooth! YUM! Roasted chickpeas are awesome! And #18 sounds amazing! Thanks for sharing this list! love these healthy suggestions – I’m starting a new diet this year and I’ve been looking for good snack ideas! I work from home so it’s so easy to grab something unhealthy to snack on or go overboard sitting at my desk. These are great snack ideas I can put together ahead of time. This is a great list. I start off eating clean but end up indulging a little too much in sweets! So so helpful! Thank you for these! I have been looking for some ideas. These are great combinations! That time between lunch and dinner is the hardest for me…thanks for new ideas and inspiration! I’ve been trying to be better too lately. I’ve been into greek yogurt and fruit – it’s very filling, unlike some snacks which don’t do anything for me at all! Veggies and hummus is my go to! I loved all of these new ideas. Apple & cheddar cheese is one of my go-tos. You’ve given me some new ideas! Mine too – ever since I was a kid! Such great ideas! I need to prep snacks like these to bring into the office! This is a great list of snacks! I’ve always found tea to be great if I want something a little sweet. Tea or a low-sugar hot chocolate always satisfy that craving. Also love reaching for fruit when I want something sweet. These are all great snack ideas everyone can take to the office or at school. I was looking for some snack ideas, so pinned this to always have it on hand. It is a great idea to make some things ahead of time so that you can just grab and go! Exactly! Then it makes it easier to grab a healthy snack instead of a bad one!! Thanks for sharing this great list of healthy snack alternatives! It always helps to plan ahead and keep the right foods on hand, for exactly the reasons you discussed. It makes reaching for something healthy much more likely to happen! I couldn’t agree more 🙂 Thanks for your thoughts! These are all such great suggestions! I am huge on snacking but I’m not good at making them healthy, haha. I definitely need to get in the habit of eating some of these! Thanks Shannon. I hear you – I love to snack!! I really need to keep my fridge tidy and get all the ingredients ready to go so it’s easy to grab and go. I love roasted chickpeas and I want to learn how to make my own. My other healthy snack go to is apples and peanut butter. I love them too. I find the easiest way is to dry roast them in a pan on the stove top. Add your spiced and just keep an eye on them moving them around every once in a while. Great combinations and great suggestions! I love snacking but not with the right foods and yes, planning has to be top priority to prepare these snacks ahead because I’m always busy and on the go. I also love tea – green tea that is. If I feel hungry mostly in the afternoon, I’d drink lemon water, but now I’m glad to have this list – healthy, nutritious and handy. Thanks for sharing, Yolanda! Hi Andre! Thanks so much for your note. I love snacking too and that’s why I made this list – so I don’t end up cheating! !